The data collected by the MODIS sensors aboard the Terra (EOS AM) and Aqua (EOS PM) satellites include a bow tie effect due to the larger ground-sampled size of the edge pixels with respect to the ground-sampled size of the image pixels located in the center of the scan. ENVI includes a re-projection method to offset the bow tie effect found in MODIS Level 1B and Level 2 data. 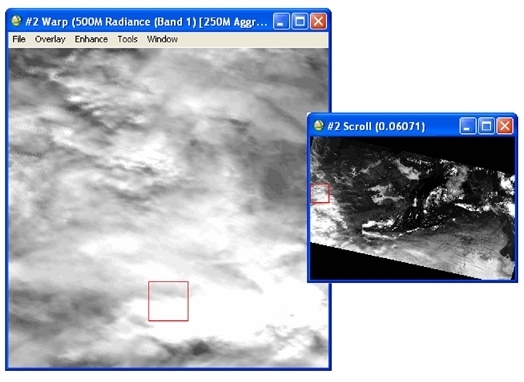 You can also georeference MODIS data and correct for bowtie artifacts by selecting Geometric Correction > Reproject GLT with Bowtie Correction from the Toolbox. The MODIS imagery must have separate Latitude and Longitude Scientific Data Sets (SDSs). The Georeference MODIS Parameters dialog contains a Perform Bow Tie Correction toggle button located at the bottom of the dialog. The default setting is Yes. Make your changes using this dialog and accept the bow tie correction. Click OK. The Registration Parameters dialog appears. Note: If the toggle button is changed to No, then ENVI performs the MODIS georeference procedure without the correction. Click OK to continue with the georeferencing and bow tie correction. ENVI adds the resulting output to the Layer Manager. 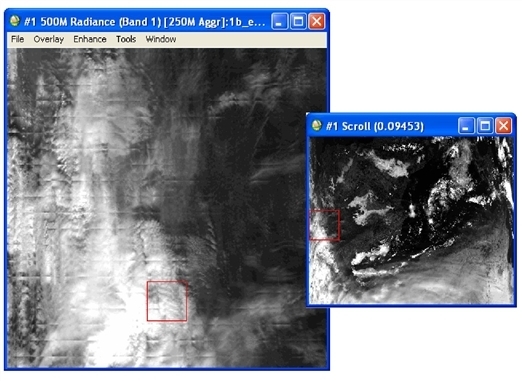 You can see the effect of the bow tie correction by displaying a radiance band from the original image, the same radiance band from the georeferenced image with no bow tie correction; and the same band from the georeferenced image with bow tie correction.